This famous Golden Retriever gives out hugs to strangers in New York City. This adopted pit bull dog named Russ loves his owner so much, he always tries to snuggle with her on the couch. The picture has been liked on Facebook 55,000 times since the dog's owner shared it! This Basset Hound named Bentley loves to give hugs. "He can sit up like a human with perfect posture," the dog's owner wrote on his blog. "[He] loves to give hugs, softly taps my arm to wake me up in the mornings, looks at us with so much love in his eyes it touches your soul, and he is hilarious." This pit bull dog likes to lovingly wrap his arms around his owner's neck. This photo of a woman hugging her dog has been shared numerous times across the Internet. This Airedale Terrier puppy was trained to give hugs on command! "When you ask him for a hug, you get one!" the dog's owner captioned the pic. This dog loves to hug his owner while posing for pictures. "This is my dog giving me a hug," the woman captioned this photo. "Ignore my awkward picture smile." While leaving on a short trip, this dog couldn't help but lean out the window to give his owner a goodbye hug. "Don't worry, it's just a goodbye for a bit," the owner wrote on Reddit, assuring concerned commenters that the dog wouldn't have to wait for her for long. This photo of a woman hugging her Bulldog puppy went viral over a year ago. "Pretty funny to watch how this photo is probably on 50 different sites :)," the photographer captioned the photo. 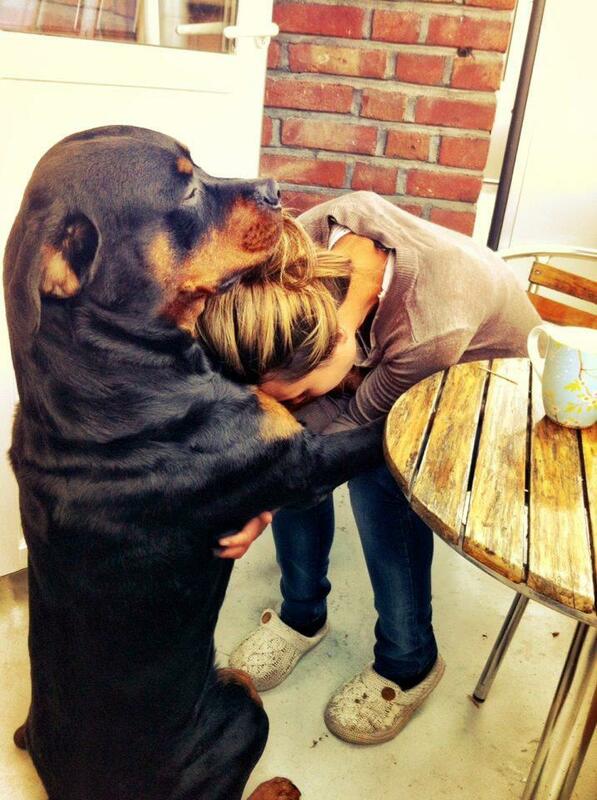 This Rottweiler hugs and consoles his owner when she's feeling sad. The picture has spread across the Internet for years, usually with the caption "there, there." This video of a dog giving his owner an "I'm sorry" hug went viral in 2015. The video showed the dog showing remorse and then burying his head into his owner's chest. Cute! This big, floofy puppy loves to give hugs before his owners leave. "A big hug from my favorite dog," the owner captioned the photo. This puppy loves to nestle against his owner's leg. "...And they call it: Puppy Love!" the owner captioned this photo.